Changing Gnome Desktop Background to an alternating multi wallpapers. This is an example of how to setup an alternating desktop wallspapers. Note: The background-1.xml file of the cosmos theme was used as a template for the background.xml above. 3. Go to Gnome Apearance Preferences and select the new theme. 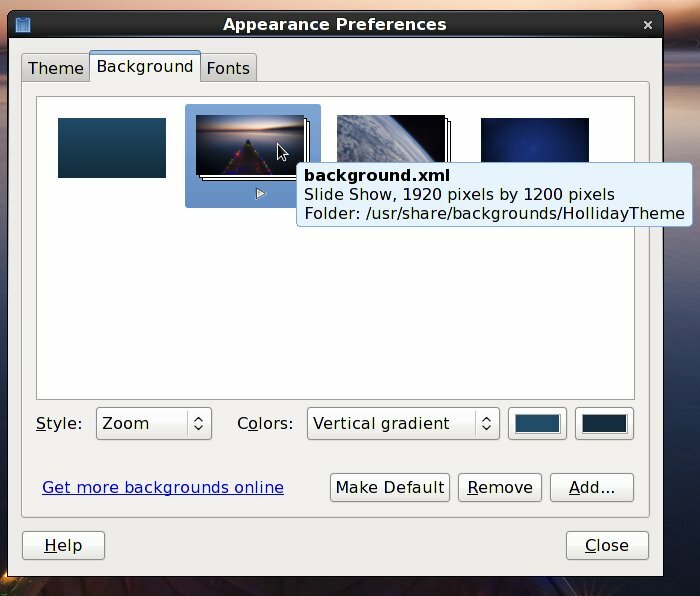 Edit the file with the following format, the location of the screensaver images is /usr/share/backgrounds/HollidayTheme, same as the gnome background example above. Go to Gnome Screensaver Preferences and select the new HollidayThemes.